Choose one of five brave heroes to bring on a quest to conquer one of five perilous dungeons. You'll use a mixture of brute force, powerful magic, and swift dexterity to overcome an array of foes and obstacles in your path. Each encounter you survive will give you loot, making you more powerful for the next one! You'll need every bit of strength you can get: the deeper you delve into the dungeon, the stronger your opponents will become (and if you reach the bottom, the boss awaits). If you're clever, daring, and just a little bit lucky, you'll walk out of the dungeon victorious! 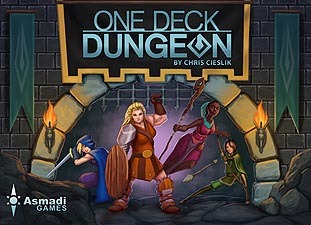 One Deck Dungeon is a co-operative dungeon delve for one or two player. If you combine two sets, you can play with a group of four.